09:10 How do you write memoir if you have lived a relatively normal life? My apologies for sounding nasally. I’ve been battling a head and chest cold the last two weeks. I should have hit up the neti pot before I hit the record button. Also, my apologies for coughing at times. The book I mention at the start, and again at the end, is The Autobiographer’s Handbook. It is available for the Kindle ($7.99) and in paperback ($13.09). The introduction is written by Dave Eggers (A Heartbreaking Work of Staggering Genius) and is edited by Jennifer Traig (Devil in the Details). Whether you consider yourself a memoirist or simply someone who is interested in capturing memories or trying to understand your life better, it’s a really good read. The Autobiographer’s Handbook has been a really motivational read for me, more so than a lot of “writing” books out there—some of which I love, some of which I loathe. Suddenly, I know that even accomplished memoirists have faced (and still face) the same stumbling blocks as I do. At last―the contemporary masters of memoir have come together to reveal their strategies and impart their advice. This book contains an unprecedented wealth of knowledge in one place. In The Autobiographers Handbook, you’re invited to a roundtable discussion with today’s most successful memoirists. Let Nick Hornby show you how the banal can be brilliant. Elizabeth Gilbert will teach you to turn pain into prose. Want to beat procrastination? Steve Almond has the answer. Learn about memory triggers (Ishmael Beah: music) and warm-up exercises (Jonathan Ames: internet backgammon). These writers may not always agree (on research: Tobias Wolff, yes, Frank McCourt, no) but whether you’re a blossoming writer or a veteran wordsmith, this book will help anyone who has ever dreamed of putting their story on paper, on writing themselves into existence. I’m not particularly comfortable or confident in speaking. As a matter of fact, I’ve often walked away feeling “stupid” after talking to someone. Hence, why I’m doing this: to face my fear. 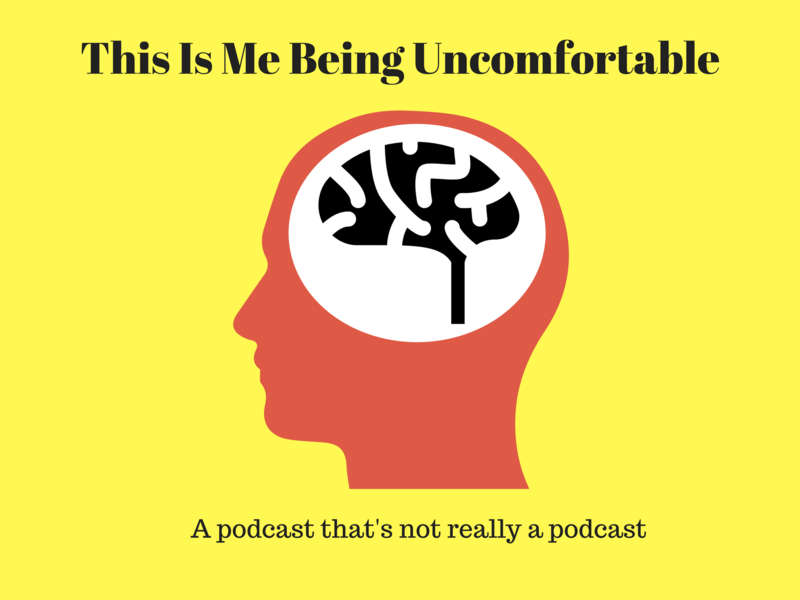 This Is Me Being Uncomfortable is a way for me to get my thoughts out of my head, and not always in written form. I’m fully aware that I don’t have the prettiest voice. You try being 6’4” tall from southern Virginia. Perhaps, I should add some soft music in the background, eh? If you’d like me to talk about a certain topic (writing, anxiety, meditation, life, death, and/or everything in between), contact me. If you enjoyed this post, share the link with friends by text message, email, or social media. Enter your email address below to receive notifications of new posts by email. No spam, ever! I have the SAME PROBLEM with follow-through. Nice to know I’m not alone. Maybe we can help each other? I remember The Court as I think of it (or when the lights go out at 10:16). I really hope you finish it. We can hold each other accountable. I’m down with that idea. I’m working on a writing calendar for When the Lights Go Out at 10:16, so that I meet certain deadlines. I’m going to customize the project tracker I use at work and share it on my blog in the next few weeks too.